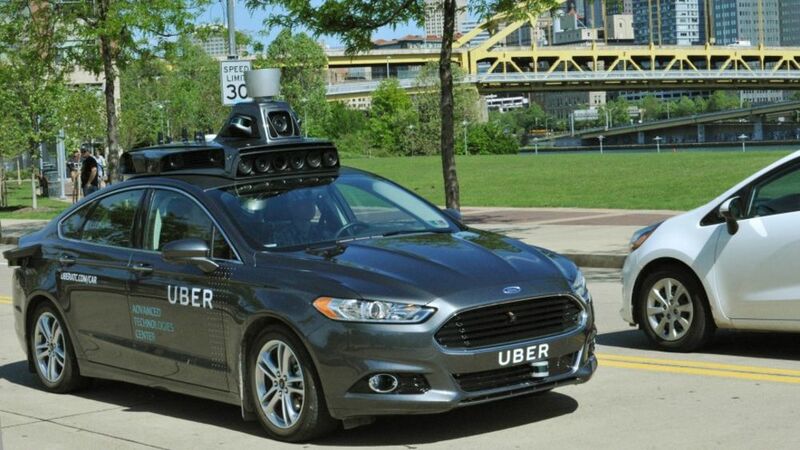 As autonomous cars begin to hit world markets in pilot tests and other ways, and before the International Federation of Robotics clarifies whether those vehicles are robots or not, two research firms have combined those vehicles with other robots. Their results are below. Tractica, by categorizing autonomous vehicles as service robots, estimates that 2016 industrial robots will drop to 41% of total robotics revenue, with the remaining 59% coming from non-industrial robots. The non-industrial service robots sector largely consists of consumer robots, enterprise robots, military robots, autonomous vehicles and supporting components, and UAVs. The combined global robotics industry will expand from $34.1 billion in 2016 to $226.2 billion by 2021, representing a compound annual growth rate (CAGR) of 46%. 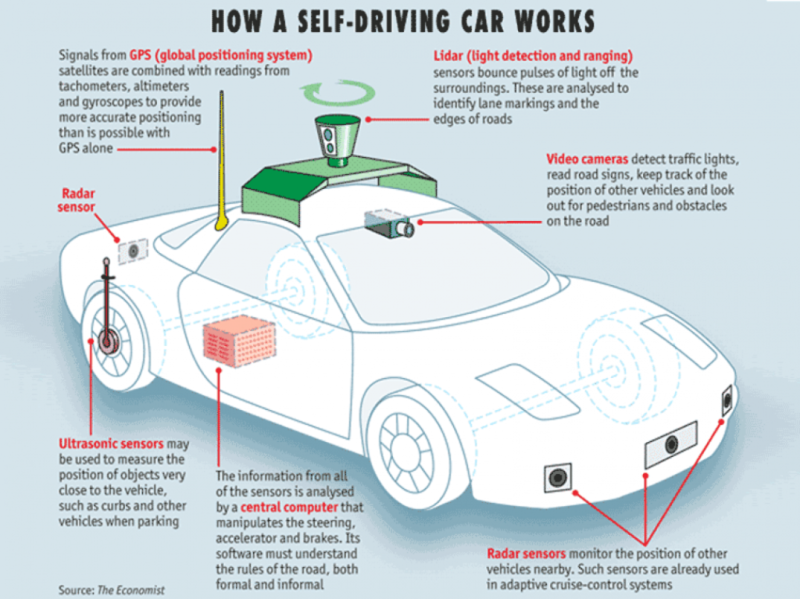 The component market servicing the driverless car market is comprised of radar sensors; video cameras; LiDAR sensor; ultrasound sensors and a central computing system. Companies profiled include Google, Inc.; Daimler AG; Ford Motor Company; Toyota Motor Corporation; BMW AG; Audi AG ; AB Volvo ; Dutch Automated Vehicle Initiative (DAVI); Autonomous Lab; and Volkswagen. The analysts forecast the global R&D spending market in the robotics industry to grow at a CAGR of 17.29% during the period 2016-2020. Rising internet and cloud infrastructure, rapid progress of wireless technology and rapid development of software frameworks and services for computational, storage, and communications infrastructure of modern data centers are the major drivers for the cloud robotics globally. Forecasts that annual worldwide AI revenue will grow from $643.7 million in 2016 to $38.8 billion by 2025. Tractica has created a taxonomy of 191 real-world use cases for AI, organized into 27 different industry sectors and corresponding with six major technology categories, plus multiple combinations of technologies. Global commercial drones market is expected to grow at an exponentially high CAGR of 41% for the forecasted period of 2016-2021. An analysis on the applications for which UAV’s have currently been used and an extensive list of potential uses which represent future sources of service revenues. Also UAV frames, power trains, control and communications and future instrumentation packages are also examined. The global drone market is anticipated to reach $4.2 billion by 2025 with a CAGR of 9.2%. By 2018, UAVs will be used by nearly every major manufacturing company to control logistics. Worldwide sales of consumer drones reached $1.9 billion in 2015 and will reach a market value of $5.0 billion by the end of 2021. Unit shipments will increase from 6.4 million units in 2015 to 67.7 million units annually by 2021. The drone payload market is estimated to be valued at USD 3.63 billion in 2016 and is projected to reach USD 7.72 billion by 2021, at a CAGR of 16.25% between 2016 and 2021. The DoD has been transitioning from acquiring new UAS to upgrading current platforms, sensors payloads, and overall capabilities. This report outlines the market payload size, and driving and restraining factors. Anti-drone systems are expected to generate $210 million in 2016. Report profiles Airbus, Blighter Surveillance Systems, Israel Aerospace Industries, Finmeccanica, Lockheed Martin, Northrop Grumman, SAAB, Thales and Boeing. The global anti-drone market is expected to reach $1.14 bn by 2022. The global solar-powered unmanned aerial vehicle (UAV) market will grow at a steady CAGR of nearly 13% through 2020. The UAV sense and avoid systems market, being an emerging market, will experience an exponential rate of growth expected to continue for next decade. This high rate of growth is attributed to the rising demand of UAVs in diverse commercial applications. The global service robotics market (defense, ag, logistics, medical, construction, mobile platform, inspection, underwater, rescue, security and others) to surpass $7 billion by 2020. Details floor, pool, window and lawn robots and profiles Dyson, Ecovacs, Infinuvo, iRobot, Philips, LG, Neato, Intellibot, Yujin and Samsung. Analysts forecast the global smart robots market to grow at a CAGR of 20.65% during the period 2016-2020. 52 companies are mentioned. Emergence of IoT predicted as key driver. Law enforcement robot markets at $1 billion in 2015 are anticipated to reach $5.7 billion by 2022. Forecasts the global security robots market to reach $2.7B by 2020. This report covers robotic as well as robot-like s/w apps (virtual rather than physical) and is projected to grow at a CAGR of 59% over next decade and will reach $49.3 bn by 2025. The global military UGV market values US$444.8 million in 2016, and is expected to grow at a CAGR of 4.76%, to value US$707.8 million by 2026. Thousands of robotic milking parlours have been installed worldwide, creating a $1.9bn industry that is projected to grow to $8bn by 2023. more than 300k tractors equipped with autosteer or tractor guidance will be sold in 2016, rising to more than 660k units per year by 2026. This report also reflects on the agrochemical business and forecasts that crop protection chemical suppliers will no longer be able to ignore developments in the world of agricultural robotics. This is because their rise will change the amount and types of chemicals used, and will force suppliers to seriously consider re-inventing themselves as providers of crop protection, whatever its form, and not just narrow chemical suppliers. Outlines and classifies; profiles emerging AI vendors; describes needs and market segmentations. Infiniti forecasts the global exoskeleton robots market to grow at a CAGR of 50.85% during the period 2016-2020. Global exoskeleton market to reach $3.75 billion by 2021. Hip and knee orthopedic surgical robot device markets at $222 million in 2015 are anticipated to reach $5 billion by 2022. Forecast Global Handicap Assistance Robots Market to grow at a CAGR of 32.12% by the number of units shipped, during the period 2016-2020. The fast growing area of Health Care IT Solutions is encompassing many different technologies including Internet of Things (IoT), broadband wireless, robotics, telepresence, artificial intelligence, machine communications, Big Data and Analytics. Global Industrial Robotics Market is expected to be more than US$ 37 Billion by 2020. Automotive and Electrical & Electronics industry together expected to control close to 70% market share. Estimates that Global Industrial Robots Market will achieve annual CAGR of 15% till 2020. The global market for collaborative robots is expected to grow at a CAGR of 60.04% between 2016 and 2022 from USD 110.0 million in 2015 and reach USD 3.3 Billion by 2022. The report includes a detailed value chain analysis and an analysis of Porter’s Five Forces model as it relates to industrial robotics. The report forecasts the global parallel robots market to grow at a CAGR of 5.7% through 2020. The global foundry and forging robots market will grow steadily at a CAGR of more than 7% to 2020. APAC countries will remain the fastest growing area within the market. Predicts the global packaging robots market to grow at a CAGR of more than 9% through 2020. APAC) Automated Material Handling Market is estimated to grow from US$7.604 billion in 2015 to US$14.364 billion by 2021, at a CAGR of 9.47% over the forecast period. EMEA automated material handling is estimated to grow from US$6.677 billion in 2015 to US$11.894 billion by 2021, at a CAGR of 10.10% over the forecast period. North America Automated Material Handling Market is estimated to grow from US$3.535 billion in 2015 to US$5.923 billion by 2021, at a CAGR of 8.98% over the forecast period. Slow, but steady growth of 3.91% CAGR during the period 2016-2020 is forecast. Segments various types of end-of-line machinery and robotics and profiles 207 companies in the field. The Global Unmanned Underwater Vehicles (UUV) Market is poised to grow at a CAGR of around 12.2% over the next decade to reach approximately $7.25 billion by 2025. Market is forecasted to grow at a CAGR of 15.5% through 2021. The fact-based backbone for many of these research reports is the International Federation of Robotics (IFR) annual World Robotics Industrial Robots and World Robotics Service Robots reports. These two books represent the official tabulation and analysis from all the robot associations around the world. The 2016 reports cover 2015 activity. The two 2016 reports can be purchased for $2,000. The industrial report will be published and available for purchase September 29, 2016 and the service report on October 12, 2016.